4' Double-Sided Floor Coat Rack from the Magnuson Group. Hangers and casters sold separately. 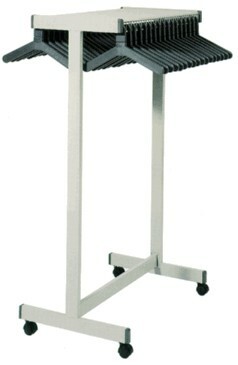 Rap Rack can be used in any of three ways for unequalled versatility. With a single row of hangers on the center rod, Rap Rack provides compact coat storage, accommodating 5 hangers per foot of rack length. With hangers on both perimeter hanger bars, Rap Rack doubles its capacity to 10 hangers per foot of length. It can also be used as a single-faced rack against a wall. 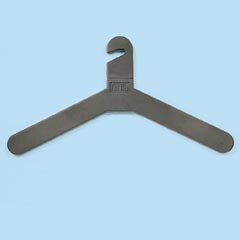 Rap Rack uses either slotted theft deterrent hangers or conventional open hook hangers. Second spacer bar which adds strength and rigidity.